When you plan a holiday with your children, amusement parks and zoos need not take up the entire itinerary. No matter where you go, you can also incorporate some engaging encounters with art and culture. Like Anish Kapoora��s Bean sculpture at the Millennium Park in Chicago, Alexander Caldera��s Eagle sculpture in Seattle, the Matisse at the Tate Modern in London, Subbodh Guptaa��s metal tree at the National Gallery of Modern Art in New Delhi, the Kochi-Muziris Biennale, and Frieda Kahoa��s home (now a museum), there are plenty of options out there. Sara Vetteth, the founder of Rainbow Fish Studio, suggests four kid-friendly vacation destinations that are her favouritea��combining great learning experiences and a fun family holiday. If you want to visit a place that will keep both you and your children entertained, visit Istanbul. 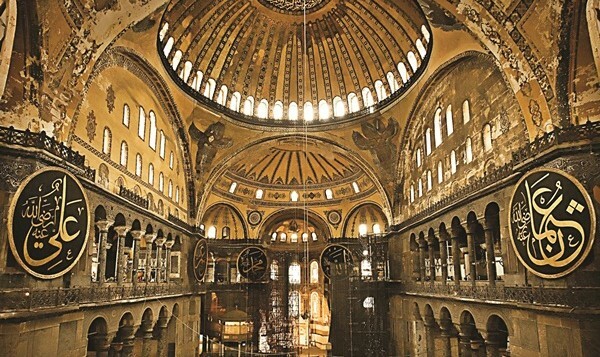 Standing for more than 1,400 years, the Hagia Sophia is an architectural beauty. Once a church, and later a mosque, it is now a museum. Show your kids the coloured marble columns and the beautiful Byzantine mosaics depicting the holy family, saints and emperors. This can lead to a fun mosaic art project when they get back. An interesting visit is the Topkapi museum, built by the first Ottoman sultan. The story goes that in the 15th century, when the palace was built, the floors were paved in gold and pearls were hung from the ceilings. Highlights include a golden replica of the Trojan horse to climb on. A child-friendly museum is the Istanbul Modern, with permanent and temporary collections of contemporary art and an interactive section for six to 12-year-olds. Also visit the Basilica Cistern, a large underground water structure containing 336 marble columns. Do not miss the wishing corner, the big carps and the giant Medusaa��s head sculpture, whose origins are still a mystery. Artist Antonio Gaudia��s Barcelona is a celebration of colours and shapes. The pavements are filled with mosaic patterns. A world to be fully explored by children is the Casa Batllo, which feels like a house of magica��the roof resembles a dragona��s back. Dona��t forget to take the circular stairs to the rooftop to see it up close. The Parc Guell houses Gaudia��s most beloved creation, Draco the mosaic dragon. The main gate is flanked by two gingerbread houses. The park also has a mosaic seating area with multi-coloured tiles. The Sagrada Familia is a must-visit. While you are looking at the stunning interiors and sculptures of the Catholic church, children can enjoy an audio guide designed for six to 12-year-olds. A highlight is the bell towers and, of course, playing on the windy staircase. When youa��ve had your fill of Gaudi, visit the FundaciA? Joan MirA? museum. Situated on top of a hill, it is a lovely place to spend an afternoon enjoying the largest collection of works by the artist. There is also a Picasso museum, which houses more than 3,500 of his artworks. Ajantha is just an houra��s drive from Aurangabad. Leave early and, en route, dona��t miss the hike up to the hill top Daulatabad fort. The views are beautiful, as are the gigantic sculptural metal cannons there. The Kailasanatha temple complex at Ajantha, carved from granite, covers twice the area of the Parthenon in Athens. It houses intricate carvings that encourage an Indiana Jones-style clamber around the cliffs, climbing through the levels to explore the interiors and terraces of the temple. Ellora caves, a couple of hours north-west of Aurangabad, boasts murals with stories from Bhuddhaa��s life, which your children might remember from stories like the Jataka Tales. Try to go early in the morning or late in the evening to escape the heat. Let your children turn explorers, as they search the caves to find the stories they know. A bonus: the incredible rocks and minerals (found in the area) that are sold outside the caves. A wonderful opportunity for kids to learn about geodes and crystals, which might even get them started on rock collecting as a hobby. Also, the return from Ellora crosses a stream running through a narrow gorge and a beautiful forested path. The Taj and its environs have a treasure trove of interesting themes to explore. Children can visit the tomb and try to pick out their favourite inlay designs. Use the clichA�d photo ops (snapshots made to look like they are carrying the monument) to introduce them to perspective and optical illusions. Dona��t miss the little horse-drawn buggy from the parking lot to the Taja��the horses have names and the drivers are chatty. You should definitely visit the Red Agra Fort and climb up on the ramparts and observe the crenellations, jalis and other architectural details. Another less famous, but surprising, gem to visit is the Tomb of Akbar. This jewel box-like monument is covered with incredible inlay work that many consider are on par in quality (though not in scale) with the Taj.Forty kilometres to the west of Agra is Fatehpur Sikri, the fortified city built by the Mughal emperor, Akbar. Whether your children had a history lesson or read one of the Akbar-Birbal comics, they will be impressed by the scale, the view and the red sandstone architecture. Not to be missed are the Buland Darwaza and the Gate of Magnificence (over 120 feet high). In the evenings, ita��s always fun to shop in the colourful bazaars.